The 2014-2015 winter may be a total waste in the Pacific Northwest as well as the Western Rockies but at least we can still hope for a descent spring in the Pacific Northwest. I am totally convinced that this winter will go down as the worst snow pack ever recorded from every Western State, including Alaska and even Western Canada. Looking at the current snow totals, from around the western part of North America, I can confidently predict that we will break all recorded totals in history. This is bad news for ski resorts, the economy, water tables, fire season and countless others. However, since the Pacific Northwest is still getting plenty of rain I can only hope that we will still enjoy a good spring. We may not have the thunderous waterfalls rolling down from the snow covered mountains but we may be blessed with lots of rain totals where snow would otherwise dominant the landscape. We may even be able to venture out along the western slopes of the Cascade mountains earlier than normal and bask in the glory of extreme beauty of the colorful vegetation and warmer temperatures. Unfortunately it’s to the dismay of the bankrupt ski resorts and broken economies that rely on the heavy snow totals. I know that we have recouped a lot of snow totals in late February and March but it seems that this pineapple express is pretty ruthless this time and it isn’t looking good for a comeback. I’m not going to put away my snow shoes and remove my snow tires just yet but I am already getting ready for some sweet waterfall shots earlier than expected. The weather in the Pacific Northwest has finally changed. This means that the weather is getting colder, wetter, stormier and very unpredictable. We can finally start to anticipate the changing colors of the leaves and the stormy clouds to appear. This will ultimately bring a lot of water to the waterfalls and snow to the higher elevations. Now is the perfect time to break out your camera and head to the Columbia River Gorge if you would like to take advantage of all the above. The waterfalls are amazing just as the rain arrives and the struggling foliage will come alive with the leaves falling from their high perch. You can also expect to witness some of the most amazing cloud formations as they move through the gorge like a freight train. I would recommend that you bring all of your rain gear as well as your best lens as well as your tripod, bubble level and remote switch. You may also want to choose the best trail since you will find yourself spending hours taking photos along the waterfalls. Sometimes I will just make a long road trip by starting out in Portland and driving to Hood River and stopping along the way. On my return trip, I will either back track or drive across the bridge of the gods, in Washington State and take some photos from the north side of the river. Either way, you can expect to get some pretty epic photos if you go on a day that is perfect for panoramic shots. 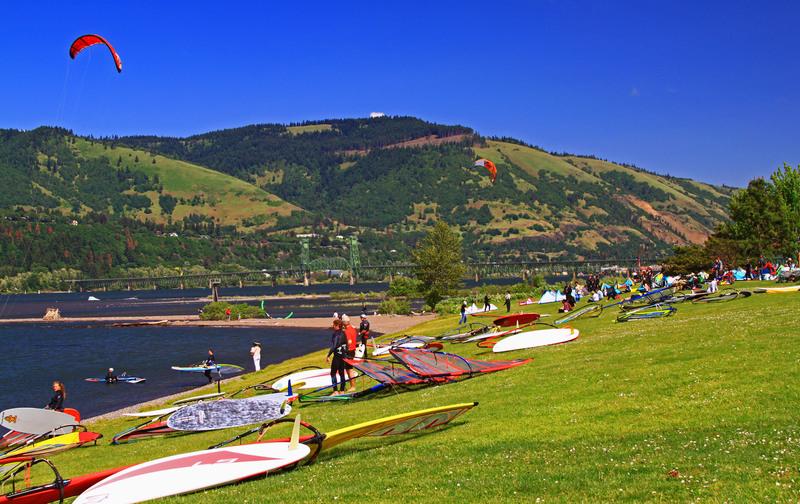 Hood River, Oregon has some of the best wind for kite surfing and windsurfing! With warm and dry wind tunneling through the Columbia river gorge, you can pretty much expect some great conditions. Hood River, Oregon pretty much has the best of both worlds. It isn’t as dry and hot as The Dalles, which is just a few miles in the east but enjoys much better sun drenched days than Portland in the west. It literally sits right at the cusp of the cool west and the dry east. Mt. Hood is just to the south of the city and Mt. Adams is just to the north. Hood River was rated as one of the best river city’s in America and one of the most outdoor oriented cities. There are several rivers that flow near the city as well as epic mt. biking and hiking trails. You are only a few miles from some of the best waterfalls in the state and only a short drive from year round skiing. Agriculture and vineyards make up the biggest part of their economy but manufacturing of kite surfing and windsurfing gear are also a dynamic part of the economy. There are also several breweries that make up the economy. The population might be small but most of the homes are owned by families that live as far away as the east coast. There aren’t a lot of places that have what Hood River has during the summer months and a quick trip will show you why. Nothing better than spending the day catching some of the best kite surfing conditions on the planet and then relaxing at a brewery taking in the views of the gorge. There are also a lot of points of interests just a short drive from Hood River. If you’re planning a trip, I would plan on spending at least a week during the summer time and plan on getting a pretty good work out. Don’t forget your kayak, bike, hiking gear, skis/snowboard, windsurfing/kite board and rock climbing gear. It’s pretty much required that you love the outdoors and really want to get a work out but if not, there are dozens of wineries and fruit stands that you can gorge on. If your into bird watching, you may also want to bring a good pair of binoculars or a telephoto lens since you are sure to see dozens of osprey, hawks, eagle, falcons and turkey vultures. The agriculture and vineyards attract every rapture you can imagine and you’re guaranteed to see them soaring above the Columbia river as well. I’v spotted several osprey catching fish in the river and then see an eagle steal it right out of their talons or coercing them to drop it from the sky. There are also several rapture nests lining along the river in the gorge. [/caption] Fast moving Tanner Creek carves its way through the moss covered basalt boulders that line the Gorge! 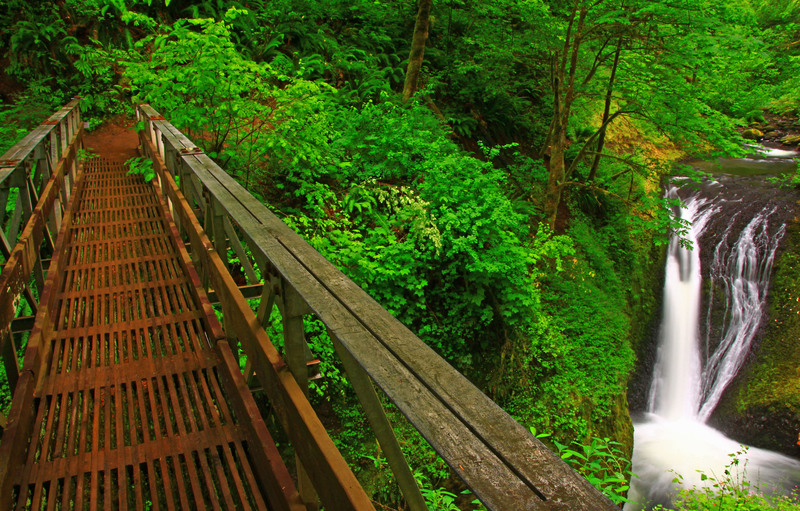 Tanner Creek offers one of the most scenic and easiest 2 mile round trip hiking trails in the Gorge. The entire trail parallels the creek with several opportunities to photograph the fast moving creek as well as stop to admire some of the waterfalls. The trail ends at the foot of Wahclella Falls and then makes a short little loop before catching up to the same trail that you came in on. If you like to scramble up basalt rocks that are fairly steep, you can hike up about 500 feet to get a more panoramic view of the steep and intimate gorge that engulfs the area. There literally is no way out of this part of the gorge without turning back and returning the same way you came. I took this shot by making a short hike from the trail and set up my tripod just above the creek. I set the shutter priority at 4 seconds and made sure to attach my warming and ND4 filter. [/caption] Several trails along the Columbia River Gorge traverse high above the waterfalls and allow hikers some pretty spectacular views of the Columbia River far below. I took this photo from a vantage point just above Yeon Park. A part of the trail meanders along the basalt rock with a long stretch of iron railing protecting hikers from a 300 foot fall below. The trail might be a little scary for hikers that are afraid of heights or if you’re afraid of narrow paths that were scraped from the rocks and allow no protection from the elements. However, the view is amazing, with Washington State standing behind the Columbia River with an island standing in the middle of the river. The hiking trail actually ends just a few hundred feet from where I took this photo with Upper McCord Creek Falls your ultimate destination and turning back point. I actually took this shot without my tripod or CIR-PL due to the overcast skies. There was absolutely no sun and it was raining most of the time, which made it hard to hike along parts of the trail that were open to the elements. On a clear and sunny day Mt. Adams would be just to the right of this photo with more views of the foothills of the Washington Cascades. [/caption] Elowah Falls is located in the Columbia River Gorge and it’s only a short drive from downtown Portland, Oregon. However, you may want to visit during the week in order to avoid the crowds during the weekends since it’s hard to get a photo without having dozens of hikers standing on the bridge or anywhere else near the falls. Another problem is that you want to pick a day that’s overcast as well as a day that the spray from the waterfall isn’t drenching the trail. So this pretty much allows only a small window of opportunity and I would recommend going during late spring or early summer since you also want the vegetation to be nice and lush. To get this shot I was using my Canon T1i and attached my Sigma 17-70mm lens. I also attached my ND4, warming and UV filter. I set the camera mode at shutter priority and set the shutter speed at 4 seconds. Because I set the ISO at 100, reduced the white balance to -0.7 and was using the ND4 filter, the aperture changed to F-20. I kept the focal length at 17mm in order to get the most panoramic shot as I could since there weren’t any hikers or other photographers along the bridge or trail. I was standing on a rock in order to get the best shot so I made sure to use my tripod, bubble level and remote switch. 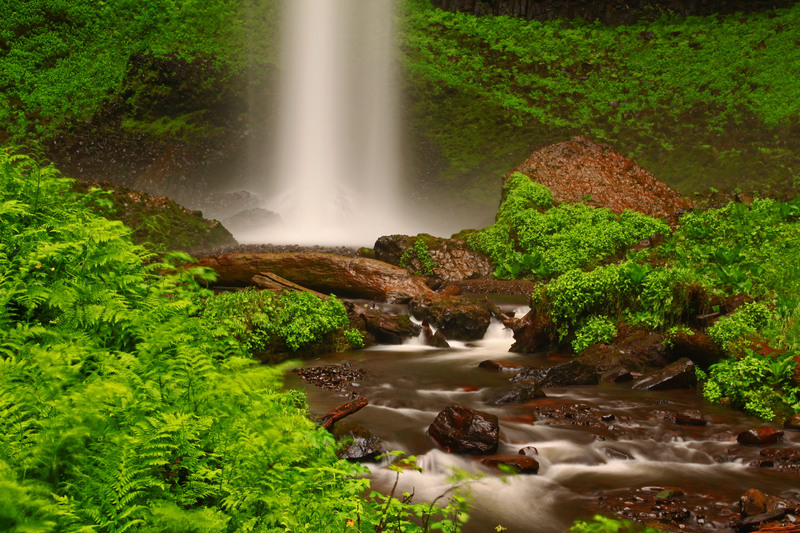 Elowah Falls is a very popular and well photographed waterfall but you have plenty of opportunities to think outside the box and look for unique shots. However, since the sun is always directly behind the top of the falls, you want to make sure and visit when it’s overcast or you will end up with your shots being over exposed. 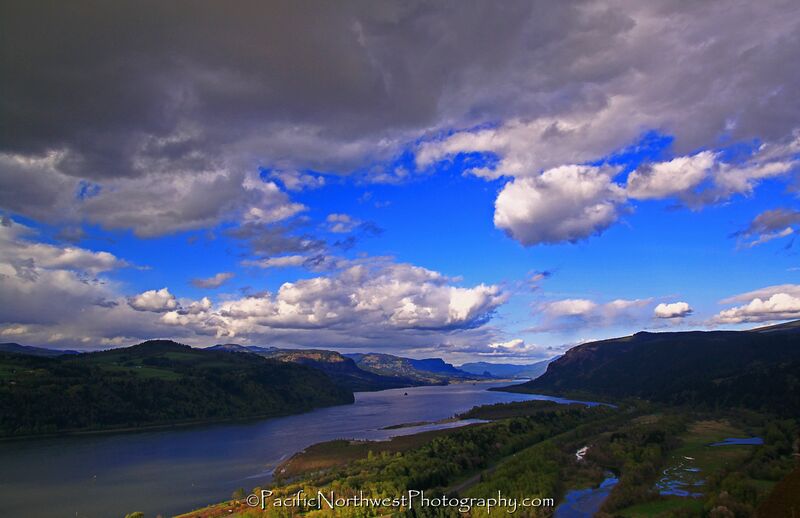 [/caption] The month of June is probably the best month to capture the Columbia River Gorge in all of it’s splendor. June offers the best weather along with the best month to witness the neon green foliage along side the thunderous waterfalls pounding the basalt rocks below. And since Spring can be pretty wet and cold, most of the wildflowers are most abundant during the month of June, which also allows some pretty fantastic photos. This particular photo opportunity really caught my eye due to the amazing cloud formation that had developed over the gorge. To get the shot I set up my tripod and used my remote switch to avoid any camera shake. I also attached my CIR-PL and warming filter due to the brightness from the sun.